I can't remember exactly how old I was or what grade I was in when I learned (that is, memorized, as we did in those days) that famous 1844 Thanksgiving poem by Lydia Maria Child, a New England abolitionist author's nostalgic evocation of family and Thanksgiving festivity. There is no snow here in the San Francisco Bay Area this morning, nor will we cross any rivers to get to my sister's house for Thanksgiving dinner later this afternoon. But what was the quintessentially New England holiday in the 1840s has long since become the quintessentially American holiday - marred, to be sure, by the contemporary capitalist excess of "Black Friday" (anticipated in more and more places now on Thanksgiving Thursday itself), but still one of the most wonderful days of the year! Norman Rockwell's famous Thanksgiving picture from the March 1943 Saturday Evening Post (photo) captures the distinct spirit of this holiday. Entitled Freedom from Want, it was originally one of Rockwell's Four Freedoms paintings that were inspired by FDR's wartime (1941) "Four Freedoms" speech. (Along with Freedom from Want, the other three freedoms were Freedom of Speech, Freedom of Worship, and Freedom from Fear). We all have much to be thankful for. At 65 going on 66, perhaps the primary thing to be thankful for is life itself. Just being here, alive and manageably well, is a grace, the first of many others - faith, family, friends, vocation, community, and, of course, the Macy's Thanksgiving Day Parade! Because of its length - and the seriousness of its substance - I must defer significant commentary until after the holiday. A few preliminary points are worth mentioning now, however. Initial media coverage - while for the most part positive - has tended to highlight the media's predictable preoccupations. Thus, we learn from the media that the Exhortation reaffirms the Church's teaching on the evil of abortion and the impossibility of ordaining women to the priesthood. But, of course, this is only news for those who mistakenly believe such teachings are subject to change. It is clear that the Pope is not preoccupied with endlessly restating Church doctrine. He has immediate pastoral priorities of the life and mission of the Church he wants to focus on. But, of course, if he neglected to mention those doctrinal matters, the media care so much about, the media would obsessively infer some sort of change. Hence the need to repeat them - a repetition that the media then emphasizes rather than emphasizing the substance of the document. A lot to think about this holiday weekend and in this holiday season, which is itself the pre-eminent season of joy and the time when the secular world is likely most receptive to the good news of the Christian story. Today is the 1st anniversary of the death of a grand old Paulist priest, Father Robert A. O'Donnell (1924-2012). When I first met him in 1981, when I was a novice, Bob was Director of the Paulist Development Office, a job he held for some six years. But, both before and after his interval as Development Director, Bob was a seminary professor of philosophy and a priest at the Paulist Church of Santa Susanna in Rome. 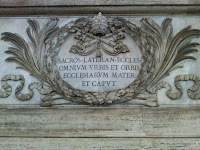 Teaching Philosophy and ministry in Rome were undoubtedly his two great loves. As a young priest in the early 1950s, he had studied for his doctorate at Louvain in Belgium and then taught philosophy for six years at the Paulist seminary in Washington, DC. Then, late in life, he taught again for 20 years in the pre-Theology program of the Archdiocese of New York. I overlapped with Bob, living at the Paulist Mother House twice during that final period for a total of 13 years. He was always a true gentleman to live with. As for his teaching, when he died I emailed two former parishioners who had joined the New York seminary, who had been taught philosophy by Bob and both of whom then went on to study theology in Rome. Both spoke highly of him, which I knew echoed the high regard he had expressed for them as students. I guess it was one of those happy cases of a devoted teacher having good students and good students having a devoted teacher! Less happy, I suspect, was his two-year tenure as President and Superior of the Paulist Seminary in Washington at the end of the 60s, that terribly turbulent time which we now recall with some combination of faux nostalgia and chagrin. It was a challenging time, but Bob survived and moved on. Along with philosophy, Bob's other truly great love was Rome. He had served as a curate at Santa Susanna in the early 60s, through the exciting years of the Second Vatican Council. He returned to Rome as Paulist Superior and Procurator General for another eight years in the 1970s. Listening to him in his later years, I always got the feeling that those years in Rome had really been a most wonderful time for him. He loved interacting with prelates in Rome and representing the American Church there. Bob really understood and appreciated the importance of our Paulist ministry in Rome and what a great privilege it is to be responsible for the parish for the American community at Santa Susanna. I had occasion to witness Santa Susanna's great ministry during my stay in Rome in early 2012, I was especially impressed by Santa Susanna's contribution to the pastoral formation of seminarians from all over the U.S. who are studying in Rome at the North American College. 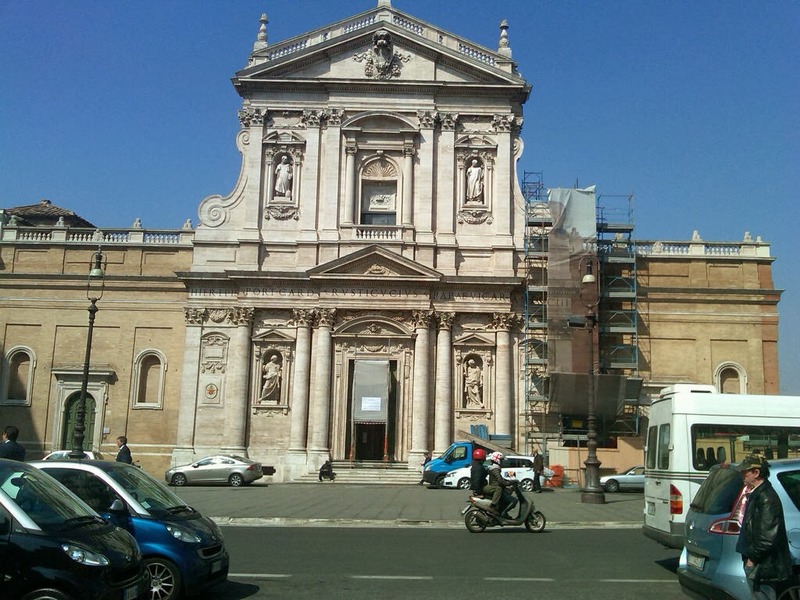 Bob returned to Rome again for yet another couple of years in the 1980s, before an interlude of ecumenical work in Bossey, Switzerland, and an adventurous three years as an assistant at the Tantur Ecumenical Institute in Jerusalem. Like many others blessed with many acquaintances, Bob annually sent out a lengthy "Christmas Letter." I always looked forward to receiving his and made sure he in turn received one from me. When he died last November, his Christmas Letters were all written and ready to be mailed. Those who sorted through and disposed of his personal possessions made the decision to send the letters - with a notation of Bob's death in case the recipient would not have heard otherwise. And so it was that some weeks after learning of Bob's death, I was surprised to receive his annual Christmas Letter, complete with his up-to-date observations on things! In 31 years of religious community life, I have been privileged to live with and come to know so many interesting and admirable priests. The exemplary way Bob O'Donnell lived his vocation reminded me of a comment recounted by Isaac Hecker. A visiting priest said to Hecker: "You have a Community, and you live and work together in harmony; but I notice that every man holds his own individuality of view and of character generally." Hecker replied that he was glad his visitor had noticed that "because it was just what ought to be." Thanks to Television, I have been a spectator at a number of state and semi-state funerals in my lifetime. But none had the impact of the first one I ever watched - that of John Fitzgerald Kennedy, the 46-year old, 35th President of the United States, assassinated after less than three years in office. It was likely the first event that the entire country ever watched together. (Marina Oswald, the assassin's widow, apparently watched as much of it as she could before having to leave to go to bury her husband, who had himself been shot and killed the day before.) It was also probably the first Catholic Mass many non-Catholic Americans ever experienced. The solemnities began with the Kennedys and the Johnsons returning to the Capitol where Kennedy had lain in state since the previous afternoon. Once again, we heard Hail to the Chief and watched the military caisson retrace the previous day's path back to the White House. There the Kennedys and the Johnsons got out of their cars and led an assemblage of 100+ Monarchs, Presidents, and Prime Ministers walking behind the coffin to Washington's Saint Matthew's Cathedral, where Boston's Richard Cardinal Cushing waited to celebrate Kennedy's Exequial Mass. Some seven years later when I was studying in Austria, a British fellow student remarked how disorganized that international procession had appeared to her. I remember replying how that was what appealed so to Americans - simultaneously combining both high dignity and a certain American-style informality! The Roman Catholicism of our first Catholic president had never been hidden, but it had rarely been so prominently on display as at his funeral. It has been said that many Americans saw their first Mass on television that day. The world-historical significance of the event notwithstanding, what they saw may not have been all that impressive. it was a Low Mass, which was at that time really rare for funerals, but which it may have been thought would make it appear less alien to an American Protestant audience. While it is true that Low Mass was less ostentatious, it also made it less obvious what was going on. So it may still have seemed an obscure ritual for those unfamiliar with it. Watching it today on YouTube, my guess is that someone who has grown up with the post-conciliar liturgy might likewise find the ceremony somewhat alien. I remember too that the Kennedys went to Communion during the Mass. Communion of the congregation at funerals was still something of a novelty, although I had experienced it once before at the funeral of one of our elementary school teachers. In those days, of course, other than Communion there were no options in the liturgy. The texts and prayers of the Mass and the Absolution after Mass were exactly what they would have been for anyone else. Some years later, a non-Catholic acquaintance commented how strange she had found Kennedy's funeral service. She was used to funerals which were all about praising the deceased, not praying to be delivered from everlasting death on that day of terror when the heavens and the earth will be shaken! If nothing else, we Catholics understood what a funeral was about - in those days at least! Outside the Cathedral, one last Hail To the Chief and the famous John, Jr., salute to his father (photo). Then the full military state procession to Arlington, which my grandmother called a festa, an word I was American enough to find jarring even if I understood the more nuanced meaning of the Italian expression. As the procession came to a halt at the cemetery, my father wondered why we had not heard the National Anthem at all. Just then the military band played The Star Spangled Banner! The standard Prayers followed (in the form they would have been said at that time), the 21-gun salute, the 50-plane overflight, the 3 Volleys, Taps, the lighting of the Eternal Flame - and then it was done. Eisenhower and Truman, as we soon learned, were famously reconciled that day. One of the prayers we used to pray in English at the end of funerals, asked, "Let our hearts, we pray you, be deeply moved at this sight of death." Something of that sort seemed to have touched the two aging ex-presidents, who that day shared a ride, reminisced, and even ate and drank together at Blair House after the funeral. That evening, a Solemn Requiem was celebrated in my parish church. My newlywed cousin and her husband, who lived in the neighborhood, attended that Mass and then stopped by our apartment afterwards. From all the reports, it was quite an overflow crowd in church that night. The civil and military ceremonies may have ended, but we Catholics were doing what we always did for one of our own. And then life resumed, and we resumed our regular routines. Historians will debate on and on about the legacy of the Kennedy years and what difference the change in presidents made or didn't make. As I recall it, foreign policy remained essentially the same, while domestic policy became somewhat more liberal. But then other things happened and the world really did change. 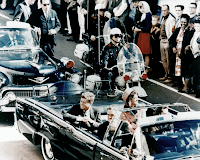 Meanwhile, the Kennedy assassination may or may not have changed America, but the Kennedy assassination weekend - i.e., the collective experience my generation had those four days - did change America, as we only appreciated in retrospect. Kennedy had come to power as the representative of the World War II generation - now known as the "Greatest Generation." They were, as Kennedy said in his Inaugural "born in this century, disciplined by war, tempered by a hard and bitter peace." But, in the years after his assassination, the next generation - the "Baby Boomers" (much less "disciplined" and much less "tempered") - pushed itself to center stage. There were so many of us! After Saturday's rain, Sunday, November 24, 1963, dawned clear and crisp. It was the Last Sunday after Pentecost - as we then called it. So (as with virtually everyone else I knew) the day started with Sunday Mass. My grandmother, as usual, went to early Mass at 7:00 or maybe 6:00. My sister Linda, then in 3rd grade, attended the 9:00 "Children's Mass." I attended the High Mass at 11:00. And then my parents went to the 12:10. Sunday Dinner followed as usual. But that was about all that was usual about that day. Like most Americans, we spent most of the afternoon transfixed by the television. The highpoint of the day was not Mass or dinner but the live coverage of the 45-minute military procession carrying President Kennedy's coffin from the White House to the Capitol, followed by the simple ceremony in the rotunda, the long lines of citizens paying their respects, and as the evening drew on the various foreign dignitaries arriving at the airport for the following day's state funeral. And, throughout it all, regular replays of the jarring scene earlier that day in Dallas, when the President's assassin was himself shot in the police station, while the world watched on live television. I remember greeting my parents at the door with the shocking news when they came home from Mass. That Sunday and Monday were meant to be - and largely were - dignified days of stately ceremony. But the weekend's second assassination seemed to lift the veil from all that dignity and stateliness and uncover something ugly - and a frightening foretaste of the darker future soon to descend upon our country. But back to dignity and stateliness! The centerpiece of the day's Kennedy coverage was, of course, the procession from the White House to the Capitol. (One can now watch that procession, thanks to YouTube. It can be accessed at http://www.youtube.com/watch?v=dL0iShjpKPw&feature=related). The coverage began abruptly with the flag-covered coffin being caried out of the White House, followed immediately by Mrs. Kennedy, in proper black, holding the hands of her two children, in matching powder-blue coats (as we were duly told by the TV commentator since, of course, most of us were watching it in black and white). Once the coffin was in place on the military caisson, the cortege quickly got moving up Pennsylvania Avenue. Unlike the bigger, more musical procession the next day, Sunday's procession was dominated by the seemingly endless sound of muffled drums. The somber sound monotonously matched the somber images. Then, when the cortege arrived at the Capitol, the mourners all got out of their cars, the military guard came to attention, and the familiar ruffles and flourishes followed. As a 21-gun salute boomed, Hail To the Chief was played in "dirge time" - i.e., 88 beats per minute instead of the usual 120. The effect was among the most memorable of the entire weekend. Hail To the Chief would be played four times that Sunday and Monday, and even now when I hear it played for other Presidents on other occasions, I often just can't help but remember that November weekend. After Hail To the Chief, the Naval Hymn accompanied the carrying of the coffin up the steps of the East Front of the Capitol and into the Rotunda. There, after Senator Mansfield's sentimental speech and two other otherwise unmemorable speeches, came the famous moment when Jackie and Caroline knelt at the bier and kissed the flag. The dignity and solemnity of such ceremonies took some of the edge off the rawness of the nation's emotions. But those emotions were never far from the surface. America has been known at tense times in our history to foster on its margins a paranoid conspiratorial mentality, that reinforces the corrosive cynicism that continues to undermine American society. Oswald's murder lent superficial credence to that tendency. Despite the lack of any serious supporting evidence, then or since, the tendentious view that Oswald didn't act alone and was part of some bigger conspiracy can still be heard 50 years later. It seems hard for some to accept the prosaic fact that such a national calamity could have no transcendent explanation and was instead the act of some otherwise uninteresting nobody - "a silly little communist" as Jackie Kennedy famously called him. The early 60s were among the coldest years of the Cold War. Both candidates in 1960, Kennedy and Nixon, were preoccupied principally with foreign policy. During the campaign, Kennedy was arguably the more strident Cold Warrior of the two. That Cold War confrontation permeated Kennedy's stirring Inaugural Address, which was almost entirely about foreign policy. Let every nation know, whether it wishes us well or ill, that we shall pay any price, bear any burden, meet any hardship, support any friend, oppose any foe, to assure the survival and the success of liberty. The great liberal domestic policy initiatives of the 1960s - Civil Rights, Medicare, etc. - would become LBJ's priorities and be enacted eventually, thanks largely to LBJ's political skill and (in the case of Medicare) the Democratic landslide of 1964. But, at least initially, they were hardly Kennedy's principal political priorities; and in any case he was unable to get such measures through a reluctant and recalcitrant Congress. In retrospect, the Civil Rights revolution may have ultimately been the most important thing going on in the country at the time, but for most of the Kennedy era it was the Cold War that dominated the president's agenda. Judged by those standards, Kennedy clearly got off to a rocky start - the fiasco of the Bay of Pigs in April 1961, followed by a far from successful Vienna Summit Meeting with the Soviet Union's combative Nikita Khrushchev, all occurring against the background of the Soviet Union's enormous propaganda triumphs in the space race. (In April, the same moth as the Bay of Pigs, a Soviet cosmonaut became the first man to orbit the earth. Kennedy's ambitious answer - challenging the nation to go to the moon before the end of the decade - was less about science and much more about beating the Russians. And how it inspired the nation! Imagine any contemporary President proposing anything so ambitious or inspiring!). Later in the summer of 1961, the Berlin Wall went up. Kennedy righty recognized that, as he is supposed to have said, a wall was better than a war. The wall had solved Khrushchev's most pressing problem and made it possible for him to tolerate the continued Western presence in West Berlin. Ceding effective Soviet control over East Berlin, liberated Kennedy to concentrate on defending Western occupation rights in West Berlin. Still, however resolute he sounded, Kennedy seemed weak - a weakness that may have contributed to Khrushchev's dangerous miscalculation in Cuba a year later. The 1962 Cuban Missile Crisis may indeed have been Kennedy's finest hour. He succeeded in getting the Soviet missiles out of Cuba - a clear win for us, a loss of face for the Soviets. At the same time, however, he practiced heroic restraint - successfully resisting the pressure for a direct attack on Cuba and avoiding the nuclear armageddon that seemed so likely. Undoubtedly, October 1962 was the closest the world ever came to nuclear confrontation. I can well remember how frightened we all were that week! Kennedy had apparently been much impressed by Barbara Tuchman's account in The Guns of August about Europe's accidental spiral into World War in 1914 and was always wary of the danger of miscalculation - a danger intensified by the presence of nuclear weapons. In retrospect, it is clear that the Cuban Missile Crisis probably also marked a turning point in popular American attitudes about the feasibility of nuclear warfare. Kennedy's 1963 American University address and even more so the Limited Nuclear Test Ban Treaty that summer reflected that evolving sensibility. Castro was still in Cuba, but 1963 proved to be the Kennedy presidency's best year. At the time, it was more or less political science conventional wisdom (which Kennedy seemed to confirm) that presidents were most likely to hit their stride and be most successful in their third year - after the fits and starts of the first years and before the next election campaign began. (That was before our contemporary permanent campaign!) The Test Ban Treaty truly was an accomplishment, and 1963 was also the year Kennedy fully embraced the Civil Rights revolution and proposed what would become - under LBJ's more effective leadership - the Civil Rights Act of 1964. But 1963 also saw Kennedy's Vietnam commitment start to unravel. The American-supported coup that eliminated South Vietnamese President Diem and his brother on November 1 did not solve the problem. Rather it accelerated South Vietnam's long-term downward spiral. Whether Kennedy might have later changed his course at some point and resolved the growing mess that our involvement in Vietnam was becoming differently from the way Johnson later did is ultimately unknowable and irresolvable. History can only record the policy he bequeathed to his successor and how his successor sought to continue it. Kennedy won in 1960 in large part because he performed better than Nixon on TV. His was the first presidency of the media age, the first based more on glamor than on substance. But, as reality keeps reminding us, what makes one a media star and gets one elected does not necessarily translate into skill at governing. He was hardly inexperienced politically, but he was evidently not quite ready for prime time when he took office, as the many missteps of that fateful first year demonstrated. But he learned from his mistakes and by 1963 was well on his way to becoming a much more successful president. Like so many other imponderables, what a second Kennedy term might have been like remains forever unknowable. But the fantasy that things might have gone differently remains a powerful force in my generation's imagination. Jackie Kennedy's post-assassination Camelot myth-making may have always been something of a stretch. Still, that musical that debuted in 1960 did express something of the feel of those early 60s years - the youthful glamor and hopeful excitement that curiously characterized the Kennedy years. It was 50 years ago today, Friday, November 22, 1963, around 2:00 p.m. I was sitting in my 3rd-year, high school English class. It was the last-period, and the end-of-the-day announcements had already been made, when the intercom came on again. Fr. G, the principal, asked us to keep in our prayers (at which point I remember wondering what student's parent perhaps had died) "the President of the United States, who has been shot." Fr, H., our teacher, said, "I thought they didn't do that in this country." Minutes later, at 2:15, the bell rang, and we headed out to our lockers and home. Engaging in adolescent speculation with some classmates about what might happen next, I headed down Andrews Avenue to Fordham Road and along Fordham to University Avenue, where I lived across the street from the church. So began that memorable weekend. Once home, I turned on the radio and then anticipating the defining role that television was going to play in our country that weekend, turned on the TV. After Walter Cronkite's famous announcement that President Kennedy had died "at 1:00 p.m. Central Standard Time, 2:00 p.m. Eastern Standard Time, some 38 minutes ago." I told my grandmother the news, then returned to the TV where some talking head was speculating about similarities to the turn-of-the-century anarchist assassinations (which had included President William McKinley in 1901, as well as Austria's Empress Elizabeth in 1898 and Italy's King Umberto I in 1900). It's strange the things that one remembers! I remember so vividly, as if it were yesterday, going down to help my mother bring up the groceries and the baby carriage my sister Christine was in. And my father coming home from work, with a final-edition newspaper of the New York Journal American, printed pre-assassination. Shortly after he got home, however, we looked out the window and saw another, post-assassination edition arrive, its terrible headline in letters large enough that we could read it four floors up. My father sent me down to buy another paper to keep as a remembrance of the day. (I still have it.) Then just before supper, in what would become a defining part of the weekend's routine, we all gathered in front of the TV to watch the President's coffin unloaded from Air Force One followed by Jackie in her blood-stained pink outfit, and then listened to the new President's first words to the nation that concluded, "I will do my best. That is all I can do. I ask your help, and God's." It is conventional to treat that date as one of those days after which everything changed. Immediately, of course, other than the change in Presidents, very little obviously changed. It is really only in retrospect that we look back on that date as a kind of boundary, marking the beginning of a much more questioning, much less trusting, much less hopeful, much less united America. At the time, in fact, America was never more united than it was that weekend, with almost the entire country glued to the TV, almost everyone simultaneously seeing and experiencing the same thing. And that unity would persist politically - despite the divisiveness of the Goldwater campaign - through the 1964 election with its monumental landslide victory for LBJ and the launch of the Great Society. Only later did it all very visibly start to fall apart. Television - especially network news - came into its own that weekend. And from its powerful position - a position from which it would not be dislodged for decades - television would be a major player in the monumental changes that were then just around the corner. But, for the moment, that future remained hidden. Most people reacted in intelligibly conventional ways. That next day, Saturday, was a rainy day on the East Coast. Television covered the comings and goings of the important people, dressed in black, arriving at the White House throughout the course of the day to pay their respects to the president lying "in repose" in the East Room, where two priests kept prayerful vigil. That Saturday afternoon, I went to confession, and was told to offer my penance for the repose of the president's soul. Roman Catholicism - then at the height of its post-war American Golden Age - would also be on national display as never before. And, much as we lamented the tragic circumstance that occasioned it, I suspect we all took some pride in the prominence of Catholic ritual and language in the nation's very public, communal mourning. 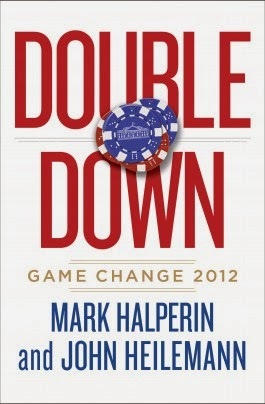 I have just finished reading Mark Halperin and John Heilemann's Double Down: Game Change 2012 (The Penguin Press/Associated, 2013), Halperin and Heilemann’s sequel to their account of the 2008 election. I read it on Kindle, not because I like reading that way – real books are by far my preference – but because, for a new book especially, it is so much cheaper that way. But it is well worth the full price! The movie version of the original Game Change focused on the Republican candidate’s selection of Sarah Palin as his running mate and the consequences thereof. What single story-line will serve as the equivalent for the movie version of Double Down remains to be seen. Dramatically, the book opens with the President’s disastrous first debate. Obama’s difficulty with the debate format effectively frames the narrative of his lawyerly personalities discomfort with the demands of contemporary campaigns. His contempt for the stupidity of the debate format and the part debates play in our elections serves as a suitable symbol for the communication problem that has so bedeviled him as president. In that regard, the comparison with his much more personable predecessor, Bill Clinton, and the book’s extensive coverage of their personal relationship and Clinton’s critical contribution to the campaign are an essential part of the 2012 story. On the Republican side, the story is that of the inevitable candidate’s not so inevitable path to the nomination through the minefield of Republican primaries, dominated by ridiculous debates with some really ridiculous candidates – how, contrary to tradition, Republican primary voters seemed hell bent on finding an alternative to Romney they could “fall in love” with. Once nominated, Romney’s story is the familiar one of the ambitious (sort of) plutocrat hopelessly out of touch with the electorate. The account highlights how what were commonly called “gaffes” (e.g., “47%”) were in the end (and were so interpreted by the other side) as insights into who Romney really was and what he was about. The media seems already to have latched on to the tension between Romney and New Jersey Governor Chris Christie as one of the leitmotifs of the Republican 2012 story. I wouldn’t be surprised if that become a major focus of the movie version! And then there is the business of money – the de facto need in our strange system to be always at the top of the fundraising game and each side’s inevitable obsession with it, which, of course, means endless attentiveness to the very rich. Money has always mattered, of course, but it has not always been so central to the process of picking our presidents. The fundraising part of the story really highlights how much our politics has changed for the worse. Such comparisons come naturally especially in this week when we recall the 50th anniversary of John F. Kennedy’s assassination. Money mattered then too, of course. Kennedy was the riches man ever elected president, and his family’s wealth mattered a lot – especially in the early primaries. That said, politics was so very different then. And there is no better way to appreciate that than to set Double Down alongside the granddaddy of all campaign books, Theodore White’s The Making of the President 1960. Both are well written excellent journalist accounts of critical presidential campaigns a half-century apart. The very different stories they tell testify to the sadly very different society and politics we have today. Last year's hit movie Lincoln opens with a scene in which President Abraham Lincoln talks to several soldiers, one of whom seems to have memorized the short speech Lincoln had delivered a little over a year earlier, on November 19, 1863, at the dedication of the National Soldiers' Cemetery at Gettysburg, PA. (In July 1863, Gettysburg been the site of one of the most significant battles of the Civil War.) The young soldier in that scene anticipated what many school children have done in the century and a half since - memorize what has since become one of the most famous and familiar examples of American civic oratory, now literally engraved in stone for the ages on the south wall of the Lincoln Memorial in Washington, DC. At the time, however, not everyone apparently agreed with the judgment of subsequent generations. The Harrisburg Patriot-News recently retracted its initial evaluation of Lincoln's speech in an 1863 editorial: "We pass over the silly remarks of the President. For the credit of the nation we are willing that the veil of oblivion shall be dropped over them and that they shall be no more repeated or thought of." Last week, however, the newspaper expressed the following revised opinion: "Seven score and ten years ago, the forefathers of this media institution brought forth to its audience a judgment so flawed, so tainted by hubris, so lacking in the perspective history would bring, that it cannot remain unaddressed in our archives." If nothing else, the Harrisburg Patriot-News illustrates how ephemeral immediate, short-term political judgments may be - an even more relevant caution in today's era of rapid response and immediate rush-to-judgment! 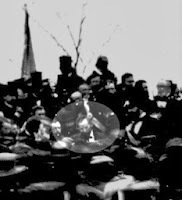 At Gettysburg that November day, the principal speech on the program was not Lincoln's but a two-hour, 13,000-word address, delivered by a great and famous American orator, Edward Everett. The President was invited to deliver merely "a few appropriate remarks" afterward. And that was what Lincoln did. In his address, Lincoln recalled the essential premise of the American experiment - equality. The complexities of the Civil War Lincoln boiled down to one central question - whether a society of equal citizens was in fact viable, "whether that nation, or any nation so conceived, and so dedicated, can long endure." It was Lincoln's challenge as a war leader - and his great accomplishment - to answer that question, to find in the seemingly senseless carnage of that terrible war a transcendent purpose. That he did in his vindication of the founding principle of equality and the institutions of citizen self-governance which equality legitimizes. Yesterday, I attended the Dedication of the new Divine Mercy Church for Knoxville's Vietnamese Catholic community. For many years, that community had found a home at Knoxville's downtown "Mother Church" of the Immaculate Conception. When I arrived as pastor at Immaculate Conception in 2010, a Vietnamese priest would regularly travel from Kentucky once each month to celebrate Mass here in Vietnamese. As the community continued to grow, so did the need for a more permanent arrangement. In June 2012, the Bishop established the Divine Mercy Catholic Mission, with its own resident Vietnamese priest, in order to meet more fully the expanding needs of the Vietnamese Catholic community. Inevitably these needs include finding a permanent church, which happened this year when the diocese acquired a former Protestant Church building. The Divine Mercy members started doing renovations at night and on weekends in order to transform it into a Catholic church. The result is an attractive modern church, which was solemnly dedicated yesterday, its altar and walls consecrated by anointing with sacred chrism (photo). The beautiful ceremony was a fitting celebration of how much the Vietnamese Catholic community in Knoxville has accomplished since its modest beginnings at Immaculate Conception parish, which today joins the Vietnamese Catholic community in joy and gratitude to God on this happy occasion and important milestone in the life of this growing Diocese. Participating in the elaborate ceremony of the Dedication of a Church reminded me of the last such event I attended - the rededication of the renovated Saint Malachy's church ("the Actors' Chapel") on 49th Street and Broadway in New York City in November 1994. I was then there part-time as deacon and was actively involved in helping the pastor plan the ceremony and served as deacon at the dedication liturgy. 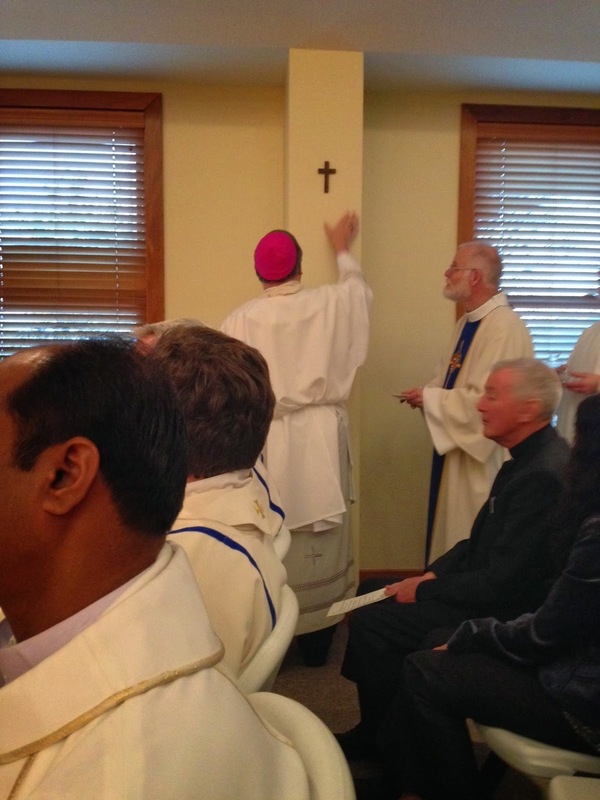 One year later, I celebrated one of my First Masses there, the Mass of the Anniversary of the Dedication. Given that churches are such special places, so central to who we are and how we live as Catholic Christians, it is no surprise that the Church has continued the Old Testament custom of keeping the anniversary of Dedication as a festival in its own right. And given the importance of the apostolic foundation of the Church, it is likewise fitting that today the Church commemorates the dedications of the Roman Papal Basilicas of Saint Peter in the Vatican and St. Paul Outside the walls, built to honor the sites of the respective burials of St. Peter, whose special relationship with Jesus is highlighted in today's Gospel [Matthew 14:22-33] and Saint Paul, whose arrival in Rome we just heard recounted in the reading from the Acts of the Apostles [Acts 28:11-16, 28-31]. 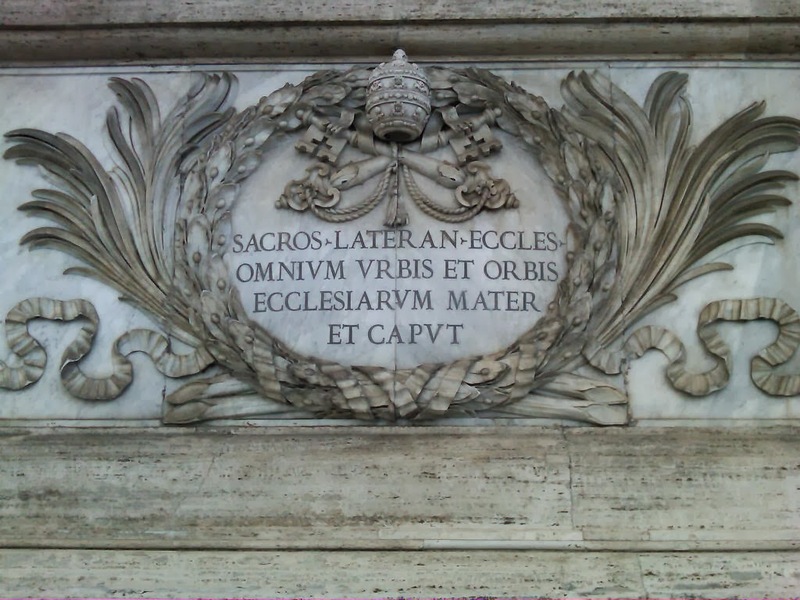 Today's date recalls the dedication of the new Saint Peter's Basilica by Pope Urban VIII in 1626, but the originals of both basilicas date back to the 4th century and have been continuous sites of pilgrimage. 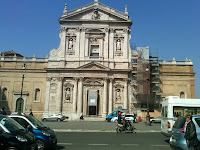 Those two ancient churches, so intimately connected to the memory of the two great apostles and associated with the ministry of the successor of Saint Peter, the Pope, obviously occupy a special place in the Church's life. But every church, however small like St, Malachy's, or new like the Divine Mercy Vietnamese Mission, is a vital center where the Risen Christ's continued presence is daily experienced among and by his consecrated and dedicated people. Homily for the Dedication of the the Basilicas of Saint Peter and Saint Paul, Immaculate Conception Church, Knoxville, TN, November 18, 2013. As the 50th anniversary of the assassination of President John F. Kennedy approaches, almost every aspect of Kennedy's life and career is being reexamined. It seems only fitting, therefore, to recall something that seemed a very big deal then - namely, Kennedy's religion. In the run-up to the 1960 election, it was widely taken for granted that Kennedy's Catholicism was an issue. Conventional wisdom still considered America a Protestant country. That was starting to change. Witness Will Herberg's now classic 1955 book, Protestant, Catholic, Jew: An Essay in American Religious Sociology. Obviously, the fact that Kennedy was elected illustrated just how much it had changed. Before 1960, however, none of that was obvious. Kenedy's primary strategy - especially in West Virginia - was predicated on the need to prove a Catholic could in fact carry Protestant votes and was actually electable. The 1960 campaign highlighted the lingering Catholic-Protestant divide in American society. Episcopal bishop (and former Roman Catholic) James A. Pike's 1960 book, A Roman Catholic in the White House, warned Protestant American against the supposed danger of a Catholic President, as did organizations like Protestants and Other United for Separation of Church and State. In the end., of course, they failed and Kennedy won in spite of his religion. Kennedy became the first Roman Catholic to be elected President of the United States in part because he amassed 83% of the Catholic vote – in contrast to the 45% won by the Democratic candidate (Adlai Stevenson) four years previously – while still holding on to approximately the same percentage of the white Protestant vote the Democrats had garnered in 1956. In other words, Kennedy got Catholics to vote for him in overwhelming numbers, without scaring too many Protestant voters away. One turning point - perhaps as important in its own way as the famous First Debate, had been Kennedy's September speech to Protestant ministers in Houston, with his famous statement: "I believe in an America where the separation of church and sate is absolute." It was JFK’s successful strategy - not just that night but throughout the campaign - to turn the anti-Catholic argument on its head and paint his opponents on this issue as the ones who were being un-American. He did it well, and he was right – as well as successful – in doing so. Since then, many have alleged that he contributed to our present predicament in which one’s religious beliefs are increasingly seen as one’s purely private quirks which ought to have no impact on one’s views on maters of public policy, a view completely at variance with the entire previous trajectory of American history. As historian Mark Massa later expressed it, Kennedy secularized “the American presidency in order to win it” (“A Catholic for President? John F. Kennedy and the ‘Secular’ Theology of the Houston Speech, 1960,” Journal of Church and State, Spring 1997). That can be overstated, however. As President, Kennedy was clearly a Catholic. Like other American Catholics, he and his family attended Mass. That and what one ate on Friday were the two obvious external markers of being a Catholic. In other respects, many Catholics were already quite indistinguishable from their Protestant neighbors. In Kennedy's case, certainly no one would mistake him for a product of Catholic schools or the so-called "Catholic Ghetto." In terms of policy, he was as "secular" as anyone else. Indeed, on the one significant denominational political issue - government aid to religious schools - Kennedy was opposed to the Church's position. In Kennedy's time, however, apart from that one issue and very unlike today, there was not the same level of cultural polarization we now take for granted on religious issues. After all, this was still an overwhelmingly religious country, characterized by a great deal of denominational diversity to be sure, but united by a deep degree of moral consensus. In its editorial on the day after his election, The New York Daily News referred to his win as having "dropped a hydrogen bomb" on the notion that a Catholic could not be elected President. And so it did. A candidate's Catholicism has never since been seen as in itself a serious obstacle. Neither really as it turned out was Judaism in the case of Joe Lieberman or Mormonism in the case of Mitt Romney. 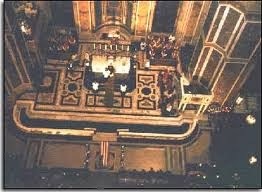 When Kennedy died, his funeral service at Washington's Saint Matthew's Cathedral (photo) was visibly Catholic. Most people had by then come to terms with the idea that this was no longer just a Protestant country. In that respect the election of our first Catholic President proved quite a success - quite different in that regard from the situation today with our first non-white President, when the fact that this is no longer just a white man's country has seemed harder for some to accept. All the Camelot nostalgia for the Kennedy years that is inevitable this week is wonderful in many ways, but it contains some cautionary tales as well. The early 60s - Camelot - coincided with some of the coldest years of the Cold War. Kennedy himself had campaigned against Nixon in 1960 as the more bellicose of the two candidates, and his stirring Inaugural Address was almost entirely about confronting the Communist threat. Since the 1950s, we had had semi-annual air-raid drills when we all had to hide under our desks if at school or take shelter if we were outdoors. What constituted "shelter" in a nuclear exchange was a curious question, of course. Given the probable consequences of a nuclear attack in terms of poisonous radiation, "fallout shelters" were quite the rage - if only among those able to afford and equip them. Our new governor, Nelson Rockefeller (elected in 1958) was big on national defense and was also a big proponent of fallout shelters. Needless to say, there was no plausible fallout shelter in our apartment building or in our parochial school or anywhere else I would have been likely to find myself. Yet, shelters themselves became a popular topic of conversation in the early 60s. In our insular Catholic "ghetto," such conversations also posed perplexing moral questions. Some priest apparently wrote an article, suggesting that it might be morally legitimate to prevent someone else (i.e., your neighbor) from coming into your shelter. No one among my family or friends had read the article, but the debate became widely known nonetheless. I vividly recall some family gathering - an apartment full of aunts, uncles, and cousins - at which it came up. (Foreign affairs often did in those days.) I remember my father dismissing the priest's argument. He profoundly objected to the idea that one should deny shelter to anyone in need. I often think of his simple, straightforward reaction. It seems to me it represented a great example of the good moral sensibility of common ordinary people trumping the complex theorizing of their supposedly sophisticated betters. Of course, in 1961 I had never heard of Merton. Nor, I am safely certain, had my father - and probably none of the other relatives at that gathering at which the issue had arisen. Nor have I ever read the offending article, which admittedly may have been more balanced and nuanced than Merton gave it credit for being. All that having been said, more than half a century later, I am still impressed by my father's good common sense about what kind of behavior was moral and what wasn't - so superior it seemed to me then and still seems to me now to the theoretical wisdom of the supposedly so sophisticated. 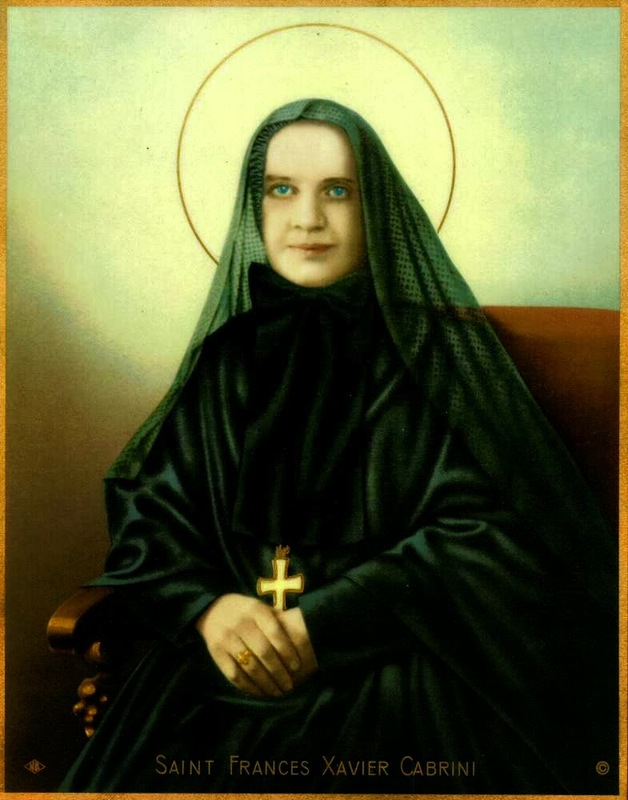 The patroness of Italian immigrants, Saint Frances Xavier Cabrini (1850-1917) was born in Lombardy in what was then still part of the Austrian Hapsburg Empire. In 1880, she founded the Missionary Sisters of the Sacred Heart of Jesus, of which she remained Superior General until her death. When she asked Pope Leo XIII's approval to establish a mission in China, he advised her to go "not to the east, but to the west" - i.e., to go to the United States to serve the immense needs of the hordes of poor Italian immigrants who were then flooding the cities of the United States. So she and six other sisters came to New York, where they founded an orphanage, the first of more than 60 schools, hospitals, and orphanages they established in the United States and in Latin America. She died in Chicago on December 22, 1917 (the 29th anniversary of the death of Isaac Hecker). She had become a naturalized American citizen in 1909 and so became the first American citizen to be canonized in 1946. Her body was enshrined under glass in the altar of her chapel at Mother Cabrini High School near Fort Tryon park and the Cloisters in New York City. When I was growing up, at least once each year my grandmother made sure we all visited her shrine and venerated he on-display body. Unlike Italy, where there a lots of saint - and saints' bodied on display - hers was the only such shrine around at that time. So it was a great curiosity to me as a youngster. I remember trying to imagine what it would be like to serve Mass at that altar and be kneeling there and staring at that body the entire Mass! Along with her body, Mother Cabrini's story and the subsequent devotion to her is a vivid reminder of the centrality of the immigrant experience in the story of our country. Her life is likewise a vivid illustration of the importance of immigration in the life of the Catholic Church in this country. Today, we continue both as a nation and as a Church to be enriched by the presence of new generations of immigrants, many of whom - like the impoverished Italian immigrants of the late 19th and early 20th centuries - find their first home here in the Church. Sent to make disciples of all nations, the Church is the oldest and most successful multi-cultural society in the world. Saints like Mother Cabrini remind the Church of its perennial mission to migrants - and of the Church's mission to remind our society of both its debt to immigrants past and its responsibilities to immigrants present and future. I’m sure I’ve told this story before, but it’s always worth repeating. One day some 30 or so years ago, when we were both seminarians, my best friend was kidding me about my rapidly diminishing hair, to which I responded by chasing him down the hall and up the stairs, where he took refuge in the chapel, grabbed hold of the altar, and confidently declared, “You can’t hit me here. This is a church!” (P.S., I didn’t hit him, and we remain good friends to this day). Churches are indeed special places. As a priest, I have been privileged to have served in two amazingly beautiful and historic churches – St. Paul the Apostle in New York, the “Mother-Church” of the Paulist Fathers, and Immaculate Conception in Knoxville, the Victorian Gothic “Mother Church” of the city of Knoxville. But there are many churches and many styles of churches, each with its own richness - rugged Romanesque churches, their interior vaults shielded by exterior towers, great gothic cathedrals, their long naves forming frames for wide windows of stained glass through which light is totally transformed and whose pointed arches just lift one to another world where gravity seems gone, and beautiful baroque churches, whose florid magnificence invites one to identify with the mystery so powerfully portrayed in their architecture. Sadly, there are also some sterile modern churches, whose standard-issue ugliness expresses the spiritual impoverishment of our age, and testifies in its own way to a culture in the process of losing its faith and increasingly bereft of hope and lacking in love. From time immemorial, people have had special places – hilltops, sacred springs, stone temples – to which to go for worship. God, of course, is personal, not local, not confined to any one place. Still, as human beings we can only operate in space and time, which is why God himself became human – in a particular place and at a particular time in human history. So it’s no surprise that, through the ages, God has continued to inspire his people to set aside special places in which to assemble to worship him. So Solomon built the Jerusalem Temple to be a holy house of prayer and sacrifice. So too the Roman Emperor Constantine the Great converted the Lateran Basilica in Rome into a church – the Pope’s church, and hence “the mother and head of all the churches of the City and the world” [photo] – the anniversary of whose dedication on November 9, 324 A.D. the Church solemnly celebrates today. It’s no accident that traditional Gospel reading for the Dedication of a Church was Luke 19:1-10, the story of Zacchaeus, the Tax Collector who famously climbed a tree to see Jesus – a usage suggested, I suppose, by Jesus’ words: Today salvation has come to this house. And that indeed is the purpose of a church. Zaccaeus did not make a church out of his tree. Rather, Jesus called him down from his tree – Zacchaeus, come down quickly, for today I must stay at your house – in order to create a church out of his house, for the Son of Man has come to seek and save what was lost. Before we build beautiful shrines and temples, God has first acted upon us. So it is not because we build buildings that we have churches, but because God has made himself the God of those buildings by first of all making himself the God of the builders – by building us, together with his crucified and risen Son, into a consecrated people, whom we also call a Church. Salvation came to Zacchaeus’ house that day, when in response to Jesus’ initiative, Zacchaeus received him with joy, boldly turning his life around. Today – and everyday – salvation comes to this house also, this church, to which we come in order to see Jesus, and within which Jesus invites himself to stay with us. Here, we too can experience the real change Zacchaeus experienced – doing what we would never otherwise have done, becoming what we would never otherwise have become, a community of forgiven sinners changed by our faith in him who invites himself to stay with us here in this house today. Homily for the Feast of the Dedication of Saint John Lateran, Immaculate Conception Church, Knoxville, TN, November 9, 2013. "The Defining Challenge of our Time"
"I’ve spoken often about a Tale of Two Cities. That inequality – that feeling of a few doing very well, while so many slip further behind – that is the defining challenge of our time." So spoke New York's new Mayor-elect, celebrating his landslide victory Tuesday night. The man soon to become New York’s 109th Mayor won an impressive victory – by some 49 percentage points – an electoral mandate if ever there was one. It was a very New York victory and a very New York mandate to be sure, but a victory and a mandate that transcend a single city. And, probably more than any other issue, it is the issue of inequality that was central to both victory and mandate - the issue the new Mayor rightly labeled "the defining challenge of our time." We all know what he was referring to. Those of us who grew up in the Golden Age of post-war prosperity have watched as middle class incomes and middle class possibilities have eroded, as education has become increasingly inaccessible, as marriage and the stability that accompanies it have become more and more a luxury. And now one-half of the nation's total income goes to the top 10% of the population - and 23% of the nation's income goes to the top 1%. Such is our sorry situation in 21st-century America. Bill DeBlasio may or may not be able to make New York one city again. But he has identified, in the widespread yearning for a society that works for everyone, the issue of increasing inequality for the defining challenge that it now is.